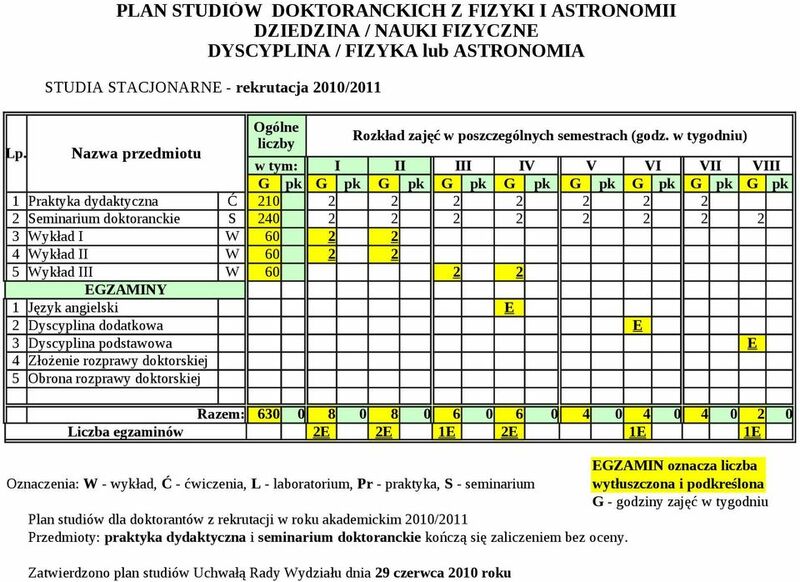 Download "PLAN STUDIÓW DOKTORANCKICH Z FIZYKI I ASTRONOMII DZIEDZINA / NAUKI FIZYCZNE DYSCYPLINA / FIZYKA lub ASTRONOMIA"
2 Doctoral Courses Schedule in Physics and Astronomy BRANCH OF SCIENCE / PHYSICAL SCIENCES DISCIPLINE / PHYSICS or ASTRONOMY FULL-TIME STUDIES admissions 2013/2014 Overall Lp. Course numbers Course schedule in a particular semester (class hours per week) including: I II III IV V VI VII VIII H pts H pts H pts H pts H pts H pts H pts H pts H pts 1 Teaching practice C Doctoral seminar S Lecture I 4 Lecture II 5 Lecture III 6 Doctoral thesis C English language 4 E 4 2 Additional discipline 3 E 3 3 Basic discipline 4 E 4 4 Dissertation defense O Razem: the number of exams 2E 2E 1E 2E 1E 1E Examination is maked Oznaczenia: L - lecture, C - classes, Lc - laboratory, S - seminar by a bold and underlined figure H hours per week pt. - ECTS PhD study plan for enrolment in the 2013/14 academic year Subjects: teaching practice, doctoral thesis and doctoral seminar finish with credit unrated. The doctoral study plan was approved by the Faculty Council at June 18th, 2013. 4 Doctoral Courses Schedule in Physics and Astronomy BRANCH OF SCIENCE / PHYSICAL SCIENCES DISCIPLINE / PHYSICS or ASTRONOMY FULL-TIME STUDIES admissions 2012/2013 Overall Lp. Course numbers Course schedule in a particular semester (class hours per week) including: I II III IV V VI VII VIII H pts H pts H pts H pts H pts H pts H pts H pts H pts 1 Teaching practice C Doctoral seminar S Lecture I 4 Lecture II 5 Lecture III 6 Doctoral thesis C English language 4 E 4 2 Additional discipline 3 E 3 3 Basic discipline 4 E 4 4 Dissertation defense O Razem: the number of exams 2E 2E 1E 2E 1E 1E Examination is maked Oznaczenia: L - lecture, C - classes, Lc - laboratory, S - seminar by a bold and underlined figure H hours per week pt. - ECTS PhD study plan for enrolment in the 2013/14 academic year Subjects: teaching practice, doctoral thesis and doctoral seminar finish with credit unrated. The doctoral study plan was approved by the Faculty Council at May 08th, 2012. 6 Doctoral Courses Schedule in Physics and Astronomy BRANCH OF SCIENCE / PHYSICAL SCIENCES DISCIPLINE / PHYSICS or ASTRONOMY FULL-TIME STUDIES admissions 2011/2012 Overall Lp. Course numbers Course schedule in a particular semester (class hours per week) including: I II III IV V VI VII VIII H pts H pts H pts H pts H pts H pts H pts H pts H pts 1 Teaching practice C Doctoral seminar S Lecture I 4 Lecture II 5 Lecture III 6 Doctoral thesis C English language 2 Additional discipline 3 Basic discipline 4 Dissertation defense O Razem: the number of exams 2E 2E 1E 2E 1E 1E Examination is maked Oznaczenia: L - lecture, C - classes, Lc - laboratory, S - seminar by a bold and underlined figure H hours per week pt. - ECTS PhD study plan for enrolment in the 2013/14 academic year Subjects: teaching practice, doctoral thesis and doctoral seminar finish with credit unrated. 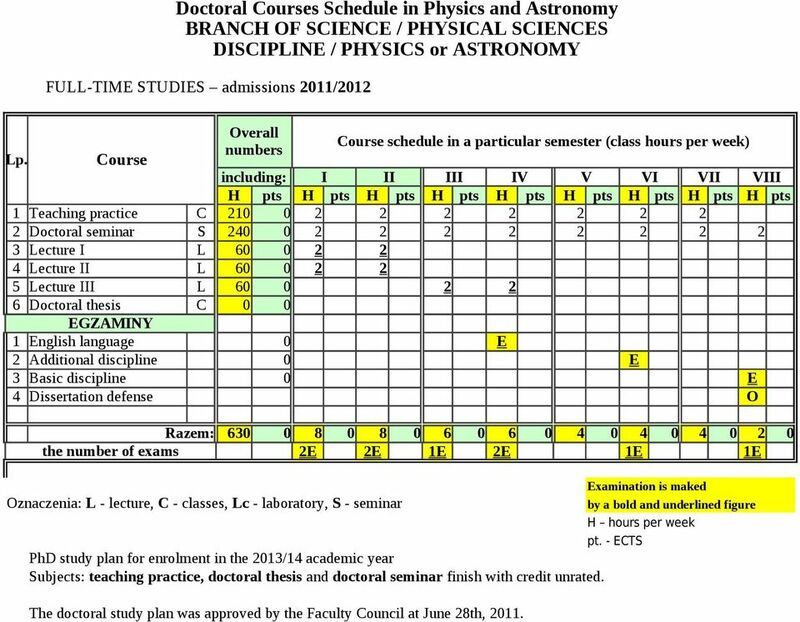 The doctoral study plan was approved by the Faculty Council at June 28th, 2011. 8 Doctoral Courses Schedule in Physics and Astronomy BRANCH OF SCIENCE / PHYSICAL SCIENCES DISCIPLINE / PHYSICS or ASTRONOMY FULL-TIME STUDIES admissions 2010/2011 Overall Lp. Course numbers Course schedule in a particular semester (class hours per week) including: I II III IV V VI VII VIII H pts H pts H pts H pts H pts H pts H pts H pts H pts 1 Teaching practice C Doctoral seminar S Lecture I 4 Lecture II 5 Lecture III 6 Doctoral thesis C English language 2 Additional discipline 3 Basic discipline 4 Dissertation defense O Razem: the number of exams 2E 2E 1E 2E 1E 1E Examination is maked Oznaczenia: L - lecture, C - classes, Lc - laboratory, S - seminar by a bold and underlined figure H hours per week pt. - ECTS PhD study plan for enrolment in the 2013/14 academic year Subjects: teaching practice, doctoral thesis and doctoral seminar finish with credit unrated. The doctoral study plan was approved by the Faculty Council at June 29th, 2010. - chemia organiczna w wymiarze minimum 200 godzin i minimum 14 punktów ECTS. Field of study: Computer Science Study level: First-cycle studies Form and type of study: Full-time studies. Auditorium classes. Program III-letnich studiów stacjonarnych pierwszego stopnia (tzw. licencjackich) o profilu akademickim na kierunku ARCHEOLOGIA w Instytucie Prahistorii UAM (wersja programu obowiązująca od roku akad. STUDIA ZAWODOWE NA SPECJALNOŚCI NAUCZYCIELSKIEJ 1. CHARAKTERYSTYKA STUDIÓW Są to dzienne, bezpłatne wyższe studia zawodowe. 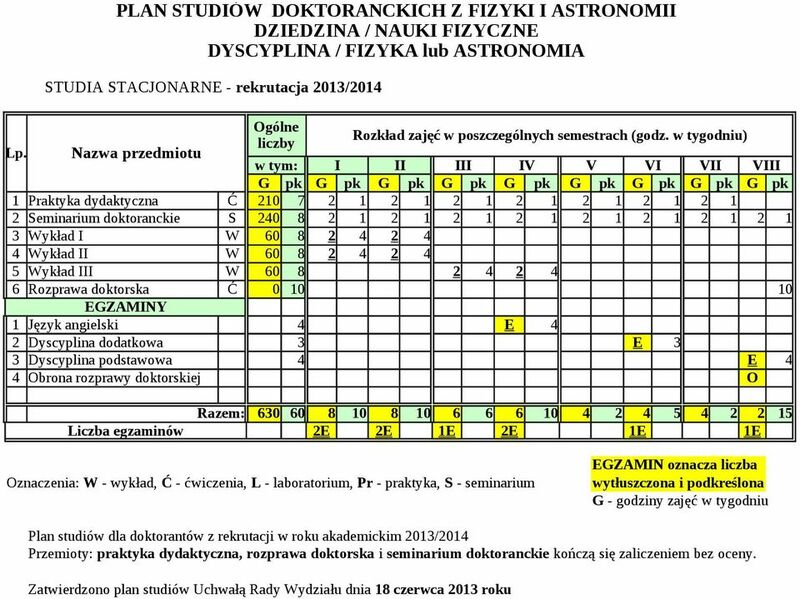 Program studiów wypełnia aktualne standardy nauczania Ministerstwa Edukacji Narodowej. Poz. 46 UCHWAŁA NR 44/2017 RADY WYDZIAŁU HISTORYCZNEGO UNIWERSYTETU WARSZAWSKIEGO z dnia 29 marca 2017 r. w sprawie wprowadzenia zmian w programach specjalizacji "Archiwistyka i zarządzanie dokumentacją"
kierunek rzeźba/ Field of study sculpture Studia jednolite magisterskie / Long-cycle studies (Master) Punkty ECTS / ECTS credits for sem.